It is officially the first day of Spring and on this most auspicious day we see that daytime and nighttime are of approximately equal duration all over the planet. They are not exactly equal, however, due to the angular size of the Sun, atmospheric refraction, and the rapidly changing duration of the length of day that occurs at most latitudes around the equinoxes. Let’s set the Science stuff aside and look at the historical nature of the Equinox. Our ancestors were more connected to the Sun than we are today. They observed its pathway across the sky; they tracked how the sunrise, sunset, and day length changed, using the Sun (and Moon) as a clock and calendar. To them it was known as Ostara. This is the ancient Pagan name for the Spring equinox. 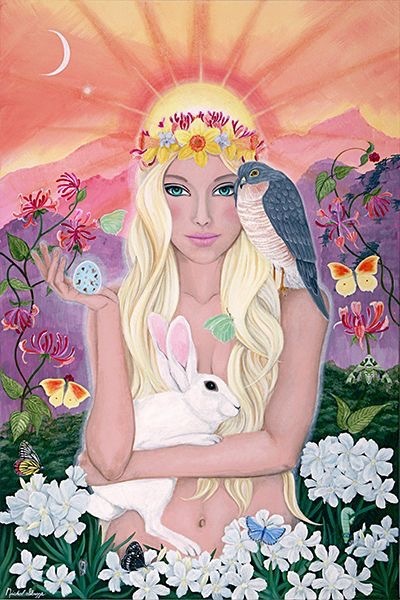 It derives from the Germanic name for Eostre, the goddess of Spring. It is a time of anticipation and hope. The name would inspire and later be appropriated by Christians to become Easter. However, before this, our ancient forebears regarded the Spring equinox as a moment of perfect balance between the seasons of Winter and Summer, the Dark and the Light. They believed that the Goddess and God were coming back to life following their Winter slumber. All around us there are signs of new life and rebirth as we watch the spring flowers burst into bud, the landscape becomes greener and more abundant, trees and flowers pollinate, animals emerge from hibernation, we witness the birth of baby animals and the days grow longer. Who hasn’t felt re-energised and rejuvenated as this productive, expansive and exuberant energy is happening all around us? Giving us all a fresh, new lease of life. The Egg contains the “all potential.” In some cultures it is a symbol for the whole universe. However it is not just contained to the childbirth aspect of fertility and new life but the concepts of personal creativity, inspiration and growth. In many cultures the rabbit signifies prosperity and good fortune. For some he is revered as a spiritual guide. His ability to survive during the long winter months teaches us a lesson on how to endure hard times. He is also a highly intuitive creature, relying on his senses to keep him alive and out of danger. So as we jouney through the Wheel of the Year reaching this pivotal point in its revolution. I wish you all a wonderful, abundant and prosperous time. As the gentle whispered promise of Imbolc is fulfilling, may your own dreams and hopes come into fruition.